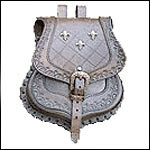 Here we have Medieval and Renaissance Accessories to finish your evening and your outfit. Come have a look at the Arm Bracers, Candlestick, Holster, Leather Gauntlets, Pouch, Purses, Re-enactment Gear, Walking Stick, Wigs and Masks. We have Arm Guards, Leather Bracers, Celtic Arm Bracers, Suede Bracers and Leather Bracers. What better way to make it complete for your Medieval or Renaissance Meal. We carry Medieval Table ware, Wooden Barrels, Goblets, Drinking Horns, Mugs, Blankets Gothic chairs, benches and stools and lots more. We carry all the settings for any special Medieval Party or Wedding Table. We have Goblet, Chalices, and Candelabras. Are you ready for a Medieval or Roman Camp Fire? Here we have great camp gear for that extra touch of ambience at your event. Walking staffs and canes are both functional and collectible. Attractively priced, these canes will appeal to the connoisseur as well as Medieval and Renaissance enthusiasts. Wigs. The ultimate touch to your historic garb, outfit or persona! Great for Medieval, Renaissance, LARP, LRP events, Plays, Theatrical use, Costume Parties and Halloween. Washable!